Soak pickles in strong salt water* 3 days. Soak in clear water 3 days, changing water each day. 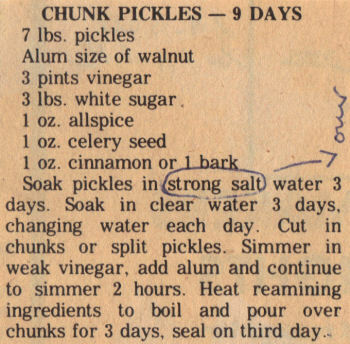 Cut in chunks or split pickles. Simmer in weak vinegar, add alum and continue to simmer 2 hours. Heat remaining ingredients to boil and pour over chunks for 3 days, seal on third day. I have made these for years…..my mom had the recipe and I misplaced it. So glad to have found it again..Thank you!